Biomethane is a naturally occurring gas which is produced by the so-called anaerobic digestion of organic matter such as dead animal and plant material, manure, sewage, organic waste, etc. Chemically, it is identical to natural gas which is stored deep in the ground and is also produced from dead animal and plant material. However, there are several important differences between biomethane and fossil fuel derived methane despite the fact that both are produced from organic matter. Natural gas is classified as fossil fuel, whereas biomethane is defined as a green source of energy. Like its name suggests, fossil fuel derived methane is produced from thousands or millions of years old fossil remains of organic matter that lies buried deep in the ground. Production of fossil fuel derived methane, however, depends exclusively on its natural reserves which vary greatly from one country to another and are not available in limitless amounts. Biomethane, on the other hand, is produced from “fresh” organic matter which makes it a renewable source of energy that can be produced worldwide. Methane is about 20 times more potent greenhouse gas than carbon dioxide if released into the atmosphere. Furthermore, its use for power generation produces heat and emits carbon dioxide and some other gases but despite that biomethane has a number of environmental benefits which make it a green source of energy. Organic matter from which biomethane is produced would release the gas into the atmosphere if simply left to decompose naturally, while other gases that are produced during the decomposition process such as nitrous dioxide for instance further contribute to the greenhouse effect. Biomethane production eliminates the release of a great deal of methane and other harmful gases into the atmosphere. This is due to the fact that its production eliminates exposure of the decomposing organic matter to the air which prevents methane and other gases from escaping into the atmosphere. In addition, biomethane reduces the need for fossil fuels by which it further reduces the emissions of greenhouse gases into the air. By reducing the need for firewood, helps preserve the forests which in turn helps lower concentration of carbon dioxide in the atmosphere as the trees absorb carbon dioxide while releasing pure oxygen. The use of organic matter for biomethane production also improves hygienic conditions and quality of life in the rural areas, and reduces the risk of water pollution. Since biomethane is chemically identical to natural gas, it can be used for the same applications as natural gas. It can be used for electricity generation, water heating, space heating, cooking as well as to fuel vehicles. 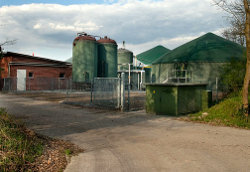 Biomethane offers great potential as an alternative source of energy, especially to fossil fuels. Despite the fact that its usability is known for quite some time, production of biomethane started only in the recent years as a result of the rising prices of natural gas and high electricity prices other fossil fuels as well as the threat of global climate change.